Before I write about anything else in my first column of 2018, I would like to say a huge well done to Peterborough United 3-1 winners in a fantastic game at the weekend. Just over a year ago the council decided to take action and yesterday we held a meeting with all group representatives to discuss our plans for the site moving forward. Councillors were shown outline designs for the scheme to help showcase the early work currently underway. They were also given an update on property acquisition on the site, which has already begun, thanks to an investment of £15million which was previously allocated for this use. The next stage for the scheme is to take a period of time to assess its commercial viability before moving forward and developing the masterplan much further. Please bear with us, as this is a vital stage, which should be not be rushed. We are taking our time and doing things thoroughly and properly. We would rather do this once, than face another decade of unrealised potential of this important site. We have a proven track record in this area too. Fletton Quays was also underutilised for decades. We created the Peterborough Investment Partnership which has kick started regeneration of this key riverfront site and it is due to open for business later this year. Fletton Quays is a great development for the city, and we want to use our experience from this to deliver a great development at North Westgate. As we embark on 2018 many of you will have made New Year’s resolutions to try and quit smoking, lose weight, get fit or something else. If you’re still struggling to think of something, can I offer a couple of suggestions that are very worthy of your time in this year. The first is really easy and will take no time at all. Our Stand Up For Peterborough campaign to lobby government for fairer funding is progressing this year. This month we have been discussing bins and highways, both of which we have a statutory duty to provide. 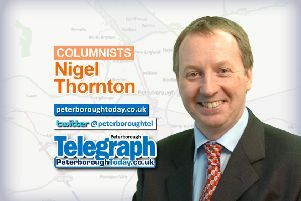 The problem is that we have had an 80 per cent reduction in our government funding (falling from £55million to £10million in 2019/20) and as you know, the population of Peterborough has expanded rapidly during this time. We now have 14,000 extra bins to collect and 17 extra miles of road, 12 miles of cycle routes and 7 miles of footpaths to maintain. Pledge your support to our campaign on our website at www.peterborough.gov.uk/StandUp to help us to lobby the government and protect these vital services. The second New Year’s Eve resolution suggestion is to sign up for the 2018 Perkins Great Eastern Run which will be taking place on October 14 and is part of our City of Festivals campaign.